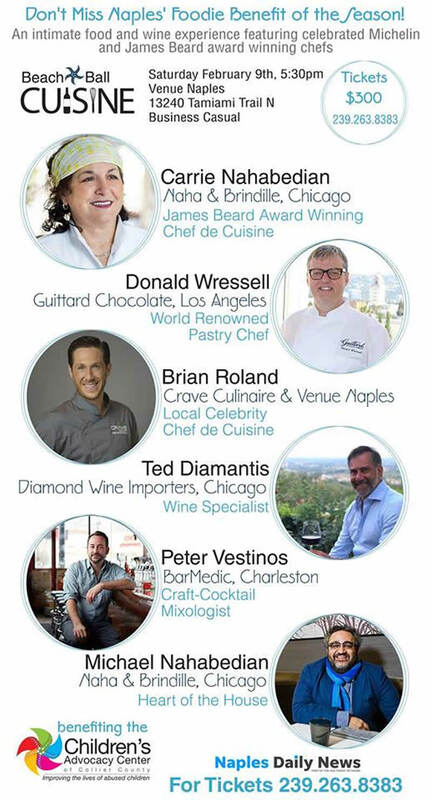 Beach Ball: Cuisine is a celebrity chef dinner that will bring to Naples, for one-night-only, some of America’s most renowned chefs, from famed Michelin Star Chefs to James Beard Award nominees, for a delightful evening of food, wine, and philanthropy. Dinner will begin with a craft cocktail reception followed by four course dinner with wine pairings from exclusive Greek vineyards, curated just for you by world renown wine importer Ted Diamantis of Diamond Wines. As guests savor the artful dessert presentation, and after celebrity chefs describe their culinary creations, silent and live auctions featuring divine culinary experiences will raise funds to help improve the lives of abused children in Collier County. Unlike the typical chef’s dinner, Beach Ball: Cuisine will be unabashedly about the food and wine. For foodies, wine aficionados, and social dining groups, Beach Ball: Cuisine will be an evening to remember.